See, InPlay is something like a fantasy sports game, only in real time. Players (that's you, not the ones on the court) choose their favorite team and player (that's the tall dudes) for the week. Then as the game plays out, each player gets points based on how the real-life team and player are performing. 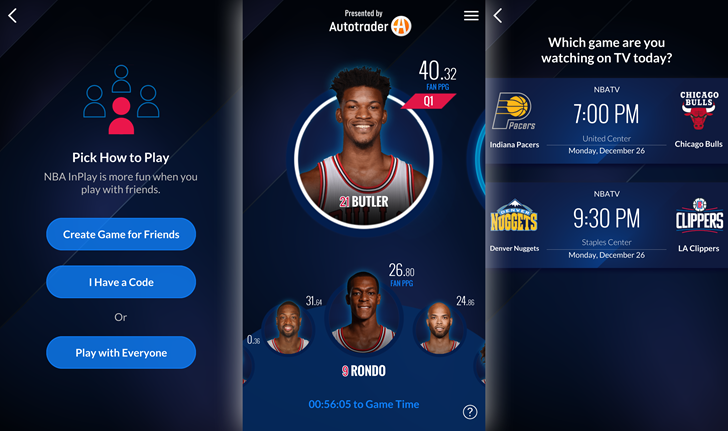 The app lets you see how you're stacking up against your friends during the live game. "Turbo mode," activated by the player, adds a point multiplier and collects points from all your team's players for 48 seconds. You can change players once a quarter, and points are tallied against both your social circle and the NBA fanbase in general in worldwide leaderboards. Unlike most fantasy sports programs (including FanDuel, which built this particular app and game), InPlay doesn't have a cash prize or a cost to enter. But players who do well in the leaderboards are eligible for prizes, which include gift cards to the official NBA store. InPlay sponsors might be adding more lucrative prizes further into the NBA season to try and boost engagement with the televised games.